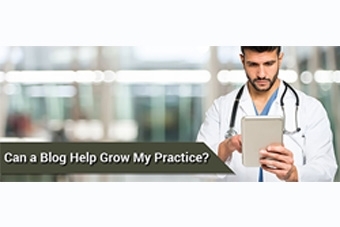 Home / Blog » Can a Blog Help Grow My Practice? Can a Blog Help Grow My Practice? Blogs are an excellent way to educate patients and keep content on your website fresh. A blog (originally from the term web log) is basically an online journal, or a vehicle to share your knowledge and thoughts to your audience. And today, more and more hospitals and healthcare professionals have blogs, and there are good reasons for that. 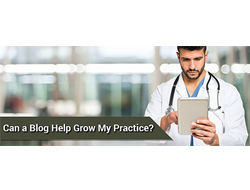 So as a healthcare professional, how can you utilize a blog to grow your practice? Build a Connection -You can make your blog personal or keep it professional. Either way, having a blog makes you more than a doctor – It makes you human, well-rounded, and relatable. Patients are always looking for information about a condition or illness. When you provide that information, they will start to trust you, follow you and talk about you. Share Your Knowledge - Blogs allow you to share your thoughts, views and knowledge about your specialty with the public. Drive Traffic to your Website - Search engines like Google value sites that have unique, quality content. Regularly posting blog posts that contain meaningful content can help push your website further up in search rankings. This makes your site and your practice even more visible to potential patients who are searching the web. Post on Social Media - Blog posts can be shared in social media and can help drive patients to your website. Make it a Video - A video blog, or vlog, is when you share information in a video format instead of text. Like a written blog, your video will be visible to public and they can rate, comment and share your videos. Recent research has shown that videos are more watched, enjoyed and shared than the text content. You can use free services like YouTube, Vimeo to host your videos. Connecting with your audience is important for your business. Posting consistently in a blog is a great way to educate your audience, share your thoughts and build that connection.